The NC generation Mazda MX-5 was released in 2006 as an upgrade to the apex hunting 2-seat roadster for the masses. The MX-5 was originally launched in the US market as the Miata in 1989 just as the classic two seat European roadster market was imploding. Sales of the MGB, Fiat Spider and Alfa Romeo Spider were either on their way down the drain or just heaping portion of Indian food away from splashdown. At the time it may have looked foolish from the outside to release a car into a market that was drying up, but the folks at Mazda knew they had the recipe right. The biggest complaint you could have about an MX-5 would be the lack of power, but plenty of folks have figured out how to squeeze more from the little 4-banger, including the builder of this next feature. 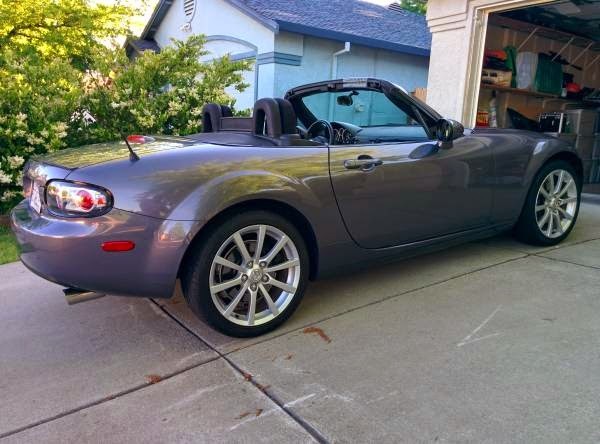 Find this 2006 Mazda MX-5 Miata offered for $11,900 in Roseville, CA via craigslist. Tip from Roy F.
The NC upgrade to the MX-5 included a sophisticated rear multi-link setup like you'd find on a formula car, an upgraded 2.0 liter inline-4, and about a hundred more pounds of curb weight. The new styling was done by Yasushi Nakamuta and it features pronounced haunches and a face that is decidedly less cute than previous versions. Under the hood of this MX-5 lurks a KraftWerks Rotrex supercharger that bumps the stock 158 horsepower engine up to 250 horsepower. 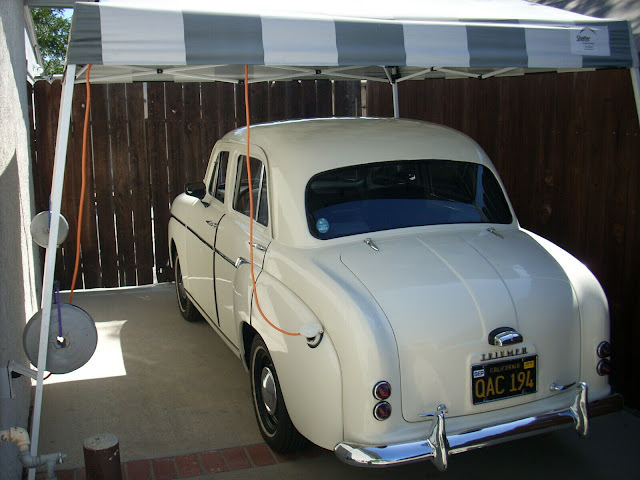 The car is probably an absolute blast to drive, it is a shame it doesn't pass California emissions requirements, but if you live somewhere free from the long arm of the smog machine, you might be able to score a deal on it. One of the greatest sports cars ever made. It's a shame I've always felt just a little too tall for the earlier Miatas. This one at least as it arrived in the US was en pointe, there seemed to be about two inches too much 'twixt tread and fender lip - and I'm not the kind of guy who wants to slam everything until the cats bash their guts out on every speedbump. The NC came to the US in dirt-rally suspension - or Fed bumper height - trim, and as such I've never had much of an affection for them. Slight smog issue...the seller better drop it off in Mississippi on the way to Boston! I see some earlier NB models converted to a turbo and of course this NC model with a supercharger. Are there any concerns using the stock engine with what I suppose is higher compression? You can get away with pushing the boost up a touch higher on a nb mazdaspeed, as their engines ran compression about a half-point lower than the standard models. So, if you wanted to push significant boost, those would be the better starting points. Probably have to upgrade the turbo, intercooler, and downpipe though. 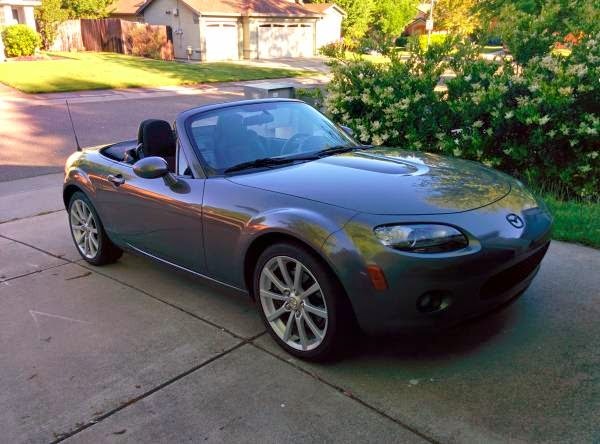 Na and nb Miatas do have a pretty stout iron block, so there's some room for fun there. Turbo, a little yes. Can't go too crazy. SC, not really. All within realistic expectations, of course. 100K is not much in a Miata, mine has considerably more. At around 11K per year-ish it sounds pretty good to me. Can't be sold in Canada? Why? Sorry, I actually blanked out when DT mentioned this and it's clearly written in the ad. Have things gotten that bad in California? It's been over 20 years since I've lived there so I don't know what's happening. 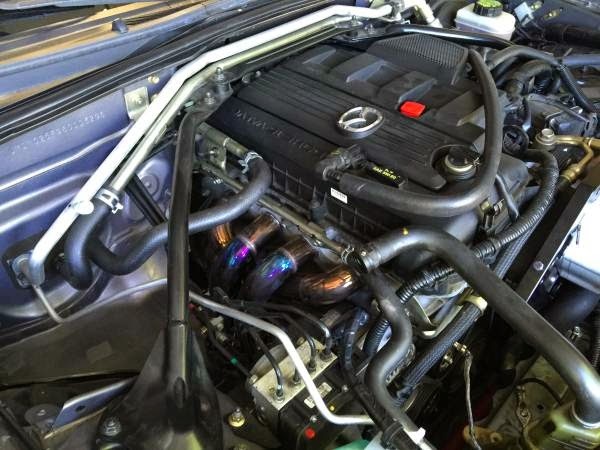 But like the seller said, why not just slap the exhaust manifold back on and test it? I have the feeling that the seller would work with a potential buyer. Or skip it and just buy a Mazdaspeed instead. With any Miata, the issue is not the block--I have never seen a block fail. Ever. The issue with boost and a stock Miata is the stock connecting rods. The stock rods in all Miatas can deal with about 12psi, whether supercharged or turbo'd. Accurate tuning is critical, running even a little lean under full boost at 12psi will bend your rods.Having a stand-alone like a Megasquirt or Hydra is the way to go, any other bandaids and you are just asking for it, not to mention the drivability. The Rotrex in this car makes good power, probably around 220hp--but that power is made way up in the rev range, like 6500rpm. So to get the most of it, you have to rev it--which isn't a problem, but low-end torque is not really there at low revs. My 1997 Miata had a Flyin Miata FMII turbo kit with a GT2560, Hydra, and other tricks. It put out 259whp/222tq on the dyno and was extremely quick, hitting full boost at 3400rpm and 200lb/ft at 2500rpm. For the people arguing turbo vs. supercharger, I had an MP62 kit on my car before going turbo. There is no comparison. The SC just felt like a slightly bigger engine, while the turbo was a rush and a rocket. This car would be extremely fun to drive, and would feel a little more like a turbo miata because of the power curve. That's what I'm talkin' about! And I like Achman's comparison between turbo and supercharger - for me, I love that sc rush from the bottom to the top, though I totally get the explosive power of the turbo. It's just that I prefer the sc. Dif strokes for dif folks!